Desirable properties including increased electrical conductivity, improved mechanical properties, or magnetism for memory storage or information processing may be possible because of a theoretical method to control grain boundaries in two-dimensional materials, according to Penn State materials scientists. Two-dimensional (2D) materials have been the focus of intense study in the last decade, but prior to the work of Yuanxi Wang, a recent Penn State doctoral graduate and Vincent H. Crespi, distinguished professor of physics, materials science and engineering and chemistry at Penn State, no one had devised a general way to control the location and type of grain boundaries in 2D materials. "When you are growing a 2D material, a thin film, you are depositing materials on a substrate," Crespi explained. "As the atoms fall onto the substrate, they self-organize into crystalline areas called grains." When the grains expand, they run into other growing crystalline regions, and where they meet is called the grain boundary. But like tiling a floor by tossing the tiles randomly, the orientation of the grains and grain boundaries are arbitrary, which affects the material properties. Until this work, published in the journal Nano Letters, these random grain boundaries were largely considered to be unfortunate byproducts of the deposition process. "Typically, when you are growing a material, those random grain boundaries are bad," said Crespi. "The atoms don't mate to each other the way they do in ordinary crystals. Current and heat don't pass through easily. They tend to scatter heat and electrons." Crespi and Wang had the idea that by manipulating the underlying substrate, they could predetermine where the grain boundaries would begin and end, and make them line up in orderly positions. The key shapes were based on something called Gaussian curvature, a series of hemispherical bumps and dips on a substrate that resembles an egg carton. 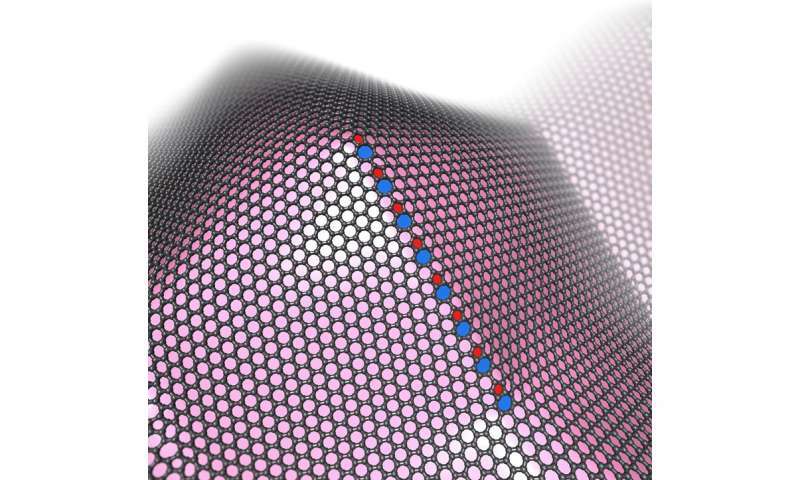 Wang did calculations that showed that for two widely studied 2D materials, graphene and molybdenum disulfide, the growth would form grain boundaries in specific locations rather than detaching from the substrate or developing unwanted folds. If the 2D material does not adhere well to the substrate, it will generate a fold. "We found that the energetics and kinetics of forming grain boundaries versus a fold or detachment, were favorable in graphene and molybdenum disulfide, and applicable to any 2D material," Wang said. "But not any bump would do. They have to have Gaussian curvature." Applications include memory storage, where controlling the magnetic state of a 2D magnetic-grain boundary system by applying a voltage would be a very useful capability. The fine control of electronic properties via grain boundaries might also be used in spintronics, which is processing information using the spin of electrons. These grain boundaries also often control the mechanical properties of materials, such as how they respond under stretching. "This gives people a new way of thinking about optimizing the properties of 2D materials where they have more control than previously," Crespi said. "We didn't know we could have such fine control of grain boundaries, and so we didn't think about carefully studying the magnetic, thermal and electronic properties of grain boundaries with an eye toward creating 'grain boundary materials' whose properties are determined by a controlled distribution of specified grain boundaries." Their article in Nano Letters is titled "Theory of Finite-Length Grain Boundaries of Controlled Misfit Angle in Two-Dimensional Materials."